Why should talented people invest their time in potential innovations that solve problems that are not life changing? When talking about profitability, creating new devices come up as the perfect match. Let’s consider the case of a lemon Juice maker (fig 1) that can cost approximately 150 USD. Why do we need people thinking about that improvements when making lemon juice can be done by a regular citrus juicer that cost 1 USD? The frugal innovation invites us to rethink where are we orienting our time to innovate and to plan the creation of new technology. Actually, it invites us to not only think of new technology but also to imagine how to give new uses to technology that already exist. Consider the case of electricity in India. More or less, 300 million people in India have no access to electricity. Frugal Innovation would address this situation by addressing one specific problem and bringing a new technological solution, at an affordable price, to solve the problems that are life-changing, and not only for problems make our life more expensive and senseless. One example is a refrigerator. How do you refrigerate your food and drinks if you have no electricity. In India, a very smart guy thought about it and came up with a refrigerator that does not use electricity but water. He used the natural evaporation process when passing the water through clay bricks. So he made a refrigerator base only in clay bricks. The outcome is a refrigerator (figure 3), without electricity able to provide 5 days of cold environment for fruits, vegetables, and milk. The cost is below the 30 USD, compared to the 500 USD price of a regular refrigerator in the market. 1.- Look for problems that matter. 2.- Invest your time in thinking out of the box and not necessarily to increase the profitability of the companies. 3.- Invest your time in planning your operation, no matter if you have a great idea, if you do not plan how you will proceed, it is not gonna work! Technology: Wind and solar power are increasingly popular sources for renewable energy. But intermittency issues keep them from connecting widely in the world. They require energy-storage systems that, at the cheapest, run about $100 per kilowatt hour and function only in certain locations. MIT researchers have developed an “air-breathing” battery that could store electricity for very long durations for about one-fifth the cost of current technologies, with minimal location restraints and zero emissions. The battery could be used to make sporadic renewable power a more reliable source of electricity for the grid. 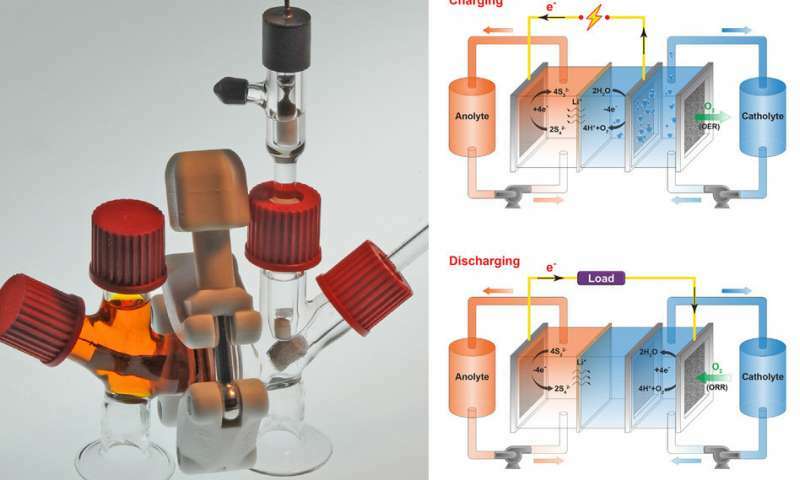 The rechargeable flow battery uses cheap, abundant sulphur dissolved in water. An aerated liquid salt solution in the cathode continuously takes in and releases oxygen that balances charge as ions shuttle between the electrodes. Oxygen flowing into the cathode causes the anode to discharge electrons to an external circuit. Oxygen flowing out sends electrons back to the anode, recharging the battery. The battery’s total chemical cost—the combined price of the cathode, anode, and electrolyte materials—is about 1/30th the cost of competing batteries, such as lithium-ion batteries. Scaled-up systems could be used to store electricity from wind or solar power, for multiple days to entire seasons, for about $20 to $30 per kilowatt hour. It is a type of flow battery, where electrolytes are continuously pumped through electrodes and travel through a reaction cell to create charge or discharge. The battery consists of a liquid anode (anolyte) of polysulfide that contains lithium or sodium ions, and a liquid cathode (catholyte) that consists of an oxygenated dissolved salt, separated by a membrane. Upon discharging, the anolyte releases electrons into an external circuit and the lithium or sodium ions travel to the cathode. At the same time, to maintain electroneutrality, the catholyte draws in oxygen, creating negatively charged hydroxide ions. When charging, the process is simply reversed. Oxygen is expelled from the catholyte, increasing hydrogen ions, which donate electrons back to the anolyte through the external circuit. This battery literally inhales and exhales air, but it doesn’t exhale carbon dioxide, like humans—it exhales oxygen. Because the battery uses ultra-low-cost materials, its chemical cost is one of the lowest—if not the lowest—of any rechargeable battery to enable cost-effective long-duration discharge. Its energy density is slightly lower than today’s lithium-ion batteries. Step one: Showcase the reliability of the technology to the public and private entities. Attract more investors and spread awareness about the usage to this technology. Step two: Set up some full-scale prototype units to prove the principles in real-world conditions. Step three: Form partnership with utility companies (Solar and wind energy) that could use this technology in their buildings to demonstrate the efficiency of the technology. I think fog harvesting can be proven as a sustainable and scalable solution to water scarcity. But my only worry is about the reliability of the water source for these fog harvesting technologies, because occurrence of fog is very much uncertain. Further, calculation of even an approximate quantity of water that can be obtained at a particular location is difficult. The technology might represent an investment risk unless a pilot project is first carried out to quantify the potential water rate yield that can be anticipated in the area under consideration. Problem: Alternative source for renewable energy. the diameter of the turbine is about 0.7 meters. The axis is attached to a permanent magnet electric generator, which is the part of the turbine that transforms the ocean wave energy into usable electricity. The ceramic mechanical seal protects the electrical components inside of the body from any saltwater leakage. This design allows the turbine to function for ten years before it need replacing. The Okinawa Institute of Science and Technology Graduate University (OIST) researchers launched The Wave Energy Converter (WEC) project in 2013. It involves placing turbines at key locations near the shoreline, such as nearby tetrapods or among coral reefs which are used as wave breaker, to generate energy. Each location allows the turbines to be exposed to ideal wave conditions that allow them not only to generate clean and renewable energy, but also to help protect the coasts from erosion while being affordable for those with limited funding and infrastructure. The turbines themselves are built to withstand the forces thrust upon them during harsh wave conditions as well as extreme weather, such as a typhoon. The blade design and materials are inspired by dolphin fins — they are flexible, and thus able to release stress rather than remain rigid and risk breakage. The supporting structure is also flexible, “like a flower,” Professor Shintake explains. “The stem of a flower bends back against the wind,” and so, too, do the turbines bend along their anchoring axes. They are also built to be safe for surrounding marine life — the blades rotate at a carefully calculated speed that allows creatures caught among them to escape. The project includes installing two WEC turbines that will power LEDs for a demonstration. Warka Tower can also generate electrical energy from sunlight. It be equipped with innovative solar panels produced by the Basilian company Sunew. The technology is based on Organic Photovoltaics, also known as OPV (Organic Photovoltaics) and the product is a thin film, light, flexible and transparent. Energy: Solar absorbers are used to transform solar radiation into thermal energy for a variety of applications – but many of these absorbers are inefficient. The inefficiency of the technology is a barrier to its large-scale replacement of non-renewable sources of thermal energy. Researchers at the Masdar Institute and MIT have developed a new technique that can raise the efficiency of a solar absorber to almost ninety percent. The technique involves piercing a solar-absorbing film with a pattern of very fine holes (less than 400 nm diamater). The nano-porous absorber can absorb a broader range of wavelengths than traditional absorbers, and also uses less material – it has only two layers (a metallic layer over a semiconductor) with a total thickness of 170 nm. The ultrathin film also exhibits low radiative losses. – GHG emissions, waste from car parts, energy use, water use, safety and health. These are sustainability issues that all car manufacturers have to deal with. Smart aims to solve these. – Environmental protection is one of smart’s top goals. The outer layer is 100% recyclable plastic. Also, each car is constructed in modules for easy dismantling . – As for safety, each car contains a steel housing that combines longitudinal and crosswise framing that displaces impact forces over a large area of the car. – The car also features excellent fuel economy that will consume less fuel, resulting in less greenhouse gas emissions. – Smart uses powder coating, which is a dry powder that does not require a solvent. This uses 40% less energy and conventional painting methods and no water is consumed or wasted. – Smart should increase marketing outside of France and Germany to increase global awareness. – Add in child friendly features, such as a section for a car seat. Making a new model of this car that is family friendly will make this car feasible for almost any consumer. – The cost is a huge plus for smart. They should easily be able to market this car in developing countries, as it is affordable, uses minimal fuel, and is recyclable. Energy: The world’s demand for energy will increase greatly in the coming century as the developing world is expected to have the same standard of living as the developed word. Thus, to meet enormous energy demands across the world and adhere to a necessary clean source of energy, fusion power can be an answer. . Conventional leather production involves a process called tanning in which different chemicals are used to make the leather soft an attractive to the consumers. Evidence has been found that many of these substances are very harmful to the environment and the health of the workers and the communities where tanning operations are held. Chromium VI is one of the most widely used chemicals and it is believed to cause skin rash, kidney and liver damage, respiratory problems, and various types of cancer among others. Piñatex is a “non-woven textile made from pineapple leaves´ fibers”. This technology is an alternative for conventional leather due to its durability and texture properties. Piñatex is a sub-product of pineapple production that uses the leaves that are left on the field to rotten. This makes the process very sustainable in the sense that no extra land is needed for it. Health authorities of leather intensive communities. The product is fully developed, but it is in constant development to achieve a greater potential. So far brands like Puma or Camper have backed it up by using Piñatex in their products. The project is ready to go to the next level for which funding from either the private or the public sector could be useful.